KMFDM can be booked through this site. KMFDM entertainment booking site. KMFDM is available for public concerts and events. KMFDM can be booked for private events and KMFDM can be booked for corporate events and meetings through this KMFDM booking page. Unlike most middle agents that would mark up the performance or appearance fee for KMFDM, we act as YOUR agent in securing KMFDM at the best possible price. We go over the rider for KMFDM and work directly with KMFDM or the responsible agent for KMFDM to secure the talent for your event. We become YOUR agent, representing YOU, the buyer. In fact, in most cases we can negotiate for the acquisition of KMFDM for international dates and newer promoters providing you meet professional requirements. Such industrial alt-metal outfits as Nine Inch Nails and Ministry received the lion's share of press and commercial success during the '90s, but there were a handful of other bands that were slugging it out for just as long (if not longer), including KMFDM. The band's name has been the subject of countless debates amongst fans over the years as to what it stands for (their record company even went as far as holding a contest in 1994 for fans to submit possible meanings, resulting in more than a thousand entries), but the confirmed meaning is Kein Mitleid Für Die Mehrheit, when translated in English means No Pity for the Majority. The German band has included countless members over the years, but through it all, their leader has remained Sascha Konietzko, whose multi-tasks have included songwriter, producer, mixer, programmer, sampler, vocalist, percussionist, bassist, and electronic gadgets. Originally formed in Paris, France, KMFDM was founded by Konietzko and German painter/multi-media performer Udo Sturm. The duo made their in-concert debut on February 29, 1984, when they performed at an opening for an exhibition of European artists at the Grand Palais in Paris (with the show consisting of Sturm playing a synthesizer that would play feedback and Konietzko playing a five-string bass). 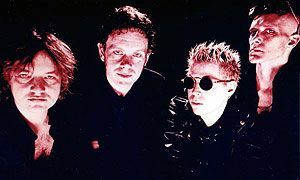 The same year, KMFDM issued its debut release, Opium, but Sturm exited the group shortly thereafter (around the same time, Konietzko was joined by drummer En Esch, who would remain with the group from then on out). With Sturm out of the picture, Konietzko and Esch put KMFDM on hold at first and joined up with New York industrialist Peter Missing to form the outfit Missing Foundations. But before the new outfit could issue any recordings, both Konietzko and Esch had dropped out and returned back to KMFDM (Missing Foundations would carry on with replacement members and go on to issue albums on their own from the late '80s through the early '90s). KMFDM's sophomore effort, What Do You Know Deutschland?, came in 1986 and was the group's first of many for Chicago's famed industrial label Wax Trax! But instead of if being an album of all new tracks, it was comprised of selections spanning from 1983 through 1986 (in fact, several were from prior to Esch's joining). Around this time, KMFDM struck up a relationship with artist Aidan Hughues (aka Brute! ), who would steadily supply cover artwork for the group the images would become synonymous with KMFDM's hard-hitting music. Konietzko and company pushed forward with such further '80s releases as 1988's Don't Blow Your Top and 1989's UAIOE, during which KMFDM found themselves in the middle of an underground industrial movement (it didn't hurt matters that Wax Trax! quickly became one of the leading industrial labels in the world, as they were the home to such other similarly styled acts as Ministry, Revco, Front 242, My Life With the Thrill Kill Kult, etc.). But KMFDM had yet to tour America by 1989 (having heavily toured Europe with the likes of Einstrüzende Neubauten, the Young Gods, and Borghesia, among others), something they sought to correct when they were offered a slot opening a U.S. tour for labelmates Ministry, who at the time were readying their classic The Mind Is a Terrible Thing to Taste release. With the tour lined up for a summer launch, it was pushed back several times (due to Ministry leader Al Jourgensen falling ill) and the tour finally got underway in December 1989. The tour successfully established KMFDM as a band to watch in the industrial underground, as they returned back to Europe after the tour's completion to work on their fifth full-length release overall, 1990's Naïve. Realizing that industrial's future lay in the U.S., Konietzko relocated KMFDM's homebase from Hamburg to Chicago during 1991. The same year, KMFDM's side-project Excessive Force was formed, issuing a debut release, Conquer Your World, in 1992, the same year that KMFDM issued a new release as well, Money. Book KMFDM for your next event! Would you like to have KMFDM perform at your next corporate event, party or concert? Simply fill out the simple interest form below, and we’ll start the booking process.